First and foremost, thanks for clicking. I know there are so many things to click on out there but you chose this and that makes you a rockstar! I'm so glad you're here because that means I get to tell you about an organization I care a lot about, Make-A-Wish. You've probably heard about it, if not, think fairy godmother on steriods making literal wishes come true for kids with critical illnesses. Jackson is kid from Burlington, NC who has idiopathic pulmonary arterial hyptertension. It's a long, scary-sounding disease that shouldn't exist. But it does... in the heart and lungs of the sweetest, coolest, little boy ever. 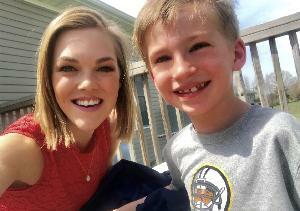 Jackson was diagnosed when he was 14 months old and since then him and his family have been fighting this nasty disease and helping others do the same. Wish kids are some of the bravest and sweetest kids. Some have simple wishes - to work in a pickle factory or push all of the buttons in a tall building's elevator. Some wish big - to become a superhero or go to outer space! But here's the thing, that wish, no matter how simple or super it may be, helps them imagine a future beyond illness and helps them fight harder. Locally, the Central and Western North Carolina chapter grants more than 360 wishes per year at an average cost of $6,000 per wish, but they can’t do it without help. As a 2018 W.I.S.H. (Women Inspiring Strength & Hope) Society Honoree, my goal is to raise enough to grant at least one child’s wish entirely. With your help, it’s possible! I mean, how can you say no? No ammount is too small. $100, $50, $25 - it doesn't matter. Be the person who makes a difference in a kid like Jackson's life.